Rudy Horn (1933-2018) was one of the best and most successful jugglers of the post-WW2 era; he was not only a great technician: It took a long time for his cup and saucers juggling routine on unicycle, which was his trademark and was unique in its time, to be emulated—principally by Chinese acrobats! He was born Rudolf Horn in Nuremberg, Germany, on February 14, 1933, in a circus family. 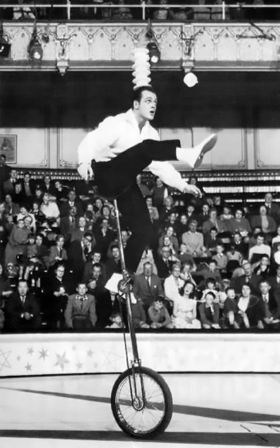 His father, Rupert Horn, had worked as a strong man before appearing in a teeterboardA seesaw made of wood, or fiberglass poles tied together, which is used to propel acrobats in the air. act and eventually creating an aerial duet, the Duo Rupertis, with his wife, Brigitte. Rudy was initiated to juggling a little by accident, on Christmas Eve 1940. His father started juggling with three apples to entertain Rudy and his baby sister, and did a series of passes to Rudy, who showed an innate ability to catch and return the fruits; after ten minutes, he could juggle them by himself! His professional path was decided then and there.